This blog post was updated on 3rd March 2017 with recent research and findings. Give it fresh read for new insights on how to build trust for your eCommerce website. eCommerce is booming as expected. Retail eCommerce sales worldwide, as predicted by eMarketer, will increase to $4.058 trillion in 2020. Users have only become more aware of fraudulent practices. Trust has become even harder to earn. This could mean loss of sales, and even losing customers in the long run. The onus is on site owners to build trust on their eCommerce website. I’ll be honest with you. This is a long post. You can jump sections using the navigation links right below. Introduction: What is Trust and its Role in eCommerce? What Factors Influence Trust in eCommerce? At the end of each section, you’ll also find a list of actionable tips to implement and improve the trust factor of your eCommerce website. What is Trust And Its Role in eCommerce? Understanding the nature of Trust is important. The problem with common words like ‘trust’ is that we all believe we understand it. ‘Trust’ in at least that sense, is taken for granted. That makes it all the more critical to establish a meaning that we understand the same way – a common frame of reference, if you will. The willingness of a party to be vulnerable to the actions of another party based on the expectation that the other will perform a particular action important to the trustor, irrespective of the ability to monitor or control that other party. As an emotion, trust has various other aspects – social, psychological, economical, philosophical – as detailed upon by Wikipedia. Three factors contribute to the state of trust: the chance for gain, chance for a loss and an uncertainty regarding the matter. Let me bring this blog article itself into context. The expected gain from this article is deriving actionable knowledge about how to improve the trust factor on your eCommerce website. The potential loss is of time that could be used doing something else. The uncertainty is if the article will provide the value or not. So if you are still reading this article, it means that you perceive that the probability of gain (knowledge, insights) is more than the probability of loss (time, opportunity cost) even though you really can’t be certain. Thanks for trusting us, we won’t disappoint. It’s important to understand that trust is not a choice, but an underlying psychological state that can be influenced. Improving the trust factor of your website helps with each of these endeavors. If you are shopping from a retailer you don’t know well, how would you decide whether to trust the website? We’ll take the top 3 factors and rip them down to the bone and leave you with immediately actionable insights at the end of each section. In a survey conducted by Mathew at Actual Insights, we found reason to believe that trust seals really influence the buying decision of users. An overwhelming majority of 61% respondents have cancelled a purchase because trust logos were missing on the website. Before we move on, let’s also understand what these terms are. What is a trust seal/badge? A trust seal on a website is a 3rd party badge shows that the website is legitimate. It is important to note that often trust seals by themselves do not indicate any technical security. Rather, they are simply a certification of the company. In contrast to trust seals, SSL certificates indicate actual technical security. They serve to show that there is a secure connection between the browser and the web server and they guard against network eavesdropping. So you understand trust seals and SSL certificates and can even differentiate between the both of them. But what matters most is if your users understand it or not. Consumers are very aware of trust seals and understand what they represent. There, trust seals do indeed work – a clear majority of people are aware of it and it plays an important part in deciding the trust your eCommerce site evokes. It’s been 10 years since the study and users have only become more internet-savvy and aware of trust seals now. There are many kinds of trust seals out there. Which Trust Seals Work Best? Here’s what was most interesting. 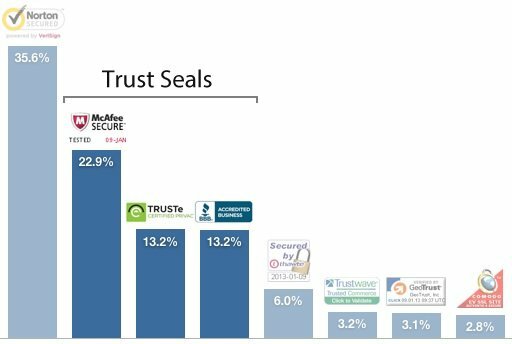 The second, third and fourth most trusted seals are trust badges where the rest are all SSL seals, including Norton that came in first, in terms of the trust they evoke. Interestingly, we find that users do not necessarily differentiate between trust badges and SSL badges. Users are not as interested in the technical implications of the badges as much as the perceived sense of security the badges evoke. Baymard notes that the two most trusted seals — Norton and McAfee — are anti-virus software brands. This shows that users naturally associate ‘security’ with these brands. The reason for this is that these brands are associated with ‘security’ in their more popular avatar as well — that of anti-virus software. A recent research (2015) by ConversionXL, further listed which seals were more trusted by males and females respectively. It also gives some interesting insights into the popularity and efficacy of various trust badges online. Does this mean having any trust seal is better than not having them at all? In the actual insights survey we already referred to, another interesting fact came to light. A staggering 76% reported having cancelled their purchase decision because they didn’t recognize the trust logo. The results suggest that your best bet is to have trust seals that are immediately recognizable. But here is the caveat: Some trust badges are not globally recognizable but are still effective in improving the trust factor and sales. For instance, House of Kids added an e-mark badge (certifies ethical conduct of Danish businesses) to their site and reaped a 32% jump in conversions. The e-mark badge is relevant only to Danish businesses but that doesn’t stop it from being effective. Remember: there are no rules to this game. The only best practice is to test. So What Trust Seals Should You Use on Your eCommerce Platform? As of 2012, 89% of brands were not using trust badges to bolster users’ trust. This statistic reveals the enormous gains that brands can achieve by acting fast and incorporating trust badges on their sites. Such a combination, they believe, will cater to all kinds of users — technical and non-technical. A technically sound user will be able to differentiate between these badges and the trust value they imply on three different areas, while a non-technical user will find three recognizable trust signals. Apart from these trust badges, there are many others that website owners employ. A trust badge could be as simple as an “authorized dealer” badge. 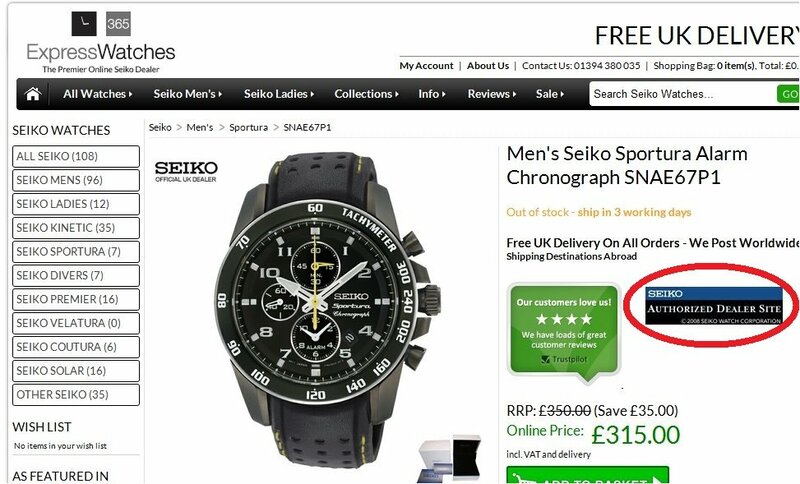 For instance, Express Watches added a “Seiko Authorized Dealer Site and achieved a 107% increase in sales. It is critical that you understand the nature of your business and choose trust badges that are relevant to your business. For instance, if you are selling eco-friendly products, it might be a good idea to have an Ecolabel certification and a related badge. When it comes to using trust badges, placement is just as important as presence. 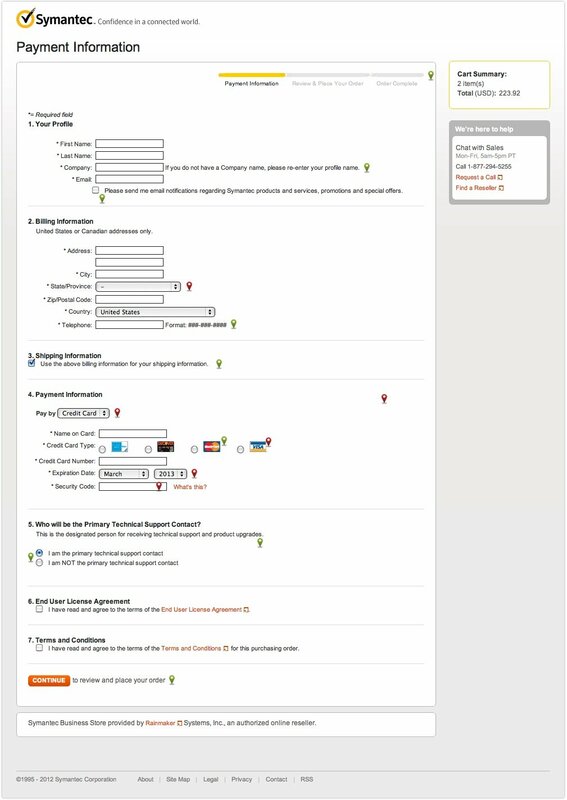 For your checkout page, we suggest boxing important fields like payment forms from the rest of the page. Aside from acting as a visual cue to direct the user towards the important part of the page, a box adds an extra sense of security. In a usability study¹ by Baymard, it emerged that placing the trust badges close to payment fields increases the perceived security of the transaction. Also, placing the trust seal above the fold will never fail to catch attention and be more prominent. What? No trust badges! The secret lies in the brand. Bigger and more popular brands already have their users’ trust and don’t need trust badges as much as smaller brands do. Small brands can gain big wins by incorporating trust badges. Now we come to the second most critical component that influences trust. We don’t trust algorithms and machines as much as we trust humans. There are many reasons, known and unknown, for this. Part of the reason is that humans are capable of empathy and feel safer with other humans than with machines. When a user is on your eCommerce store for the first time, their ‘danger’ antennae are in overdrive. Displaying contact information says that you’ve nothing to hide from the user. Contact information gives a strong indication that there is a real person at the other end who can be approached should anything go wrong. Notice how they establish a very human connection on the page. Words like ‘we’, ‘family’ are liberally used on the page to bring down user anxiety. 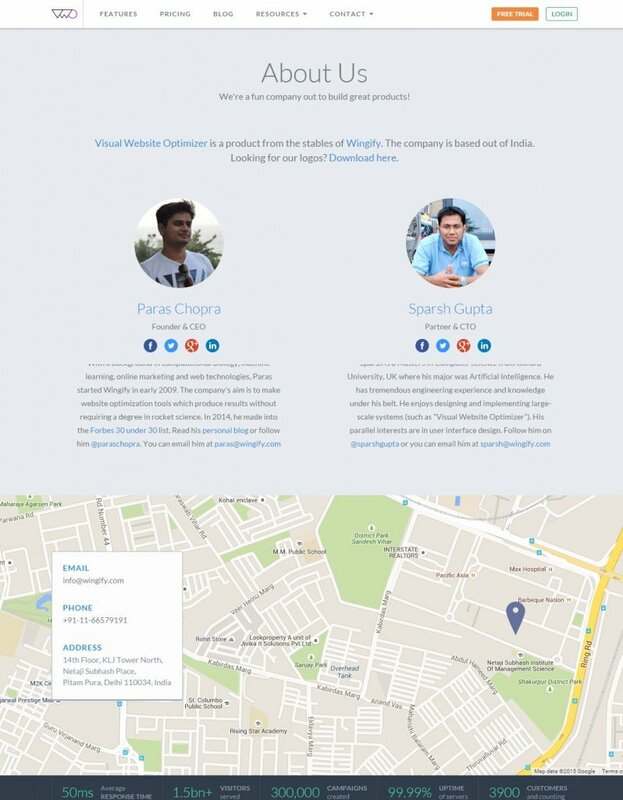 Multiple ways are displayed for a user to get in touch with the team — 24×7 phone number, email or a direct conversation. If there was just a phone number, you’d be relieved, but Zappos delivers over and above typical customer expectations by providing multiple channels of communication. It helps ease the slightest of anxieties users have about shopping online at Zappos. Read about how Flowr increased conversions simply by adding a phone number to the header. Apart from this obvious benefit, contact page is also a potent lead generation engine. Users can directly get in touch with your sales team. This is particularly important for professional services where client-consultant interactions are best done in person. It’s not just contact information that can help establish the human connection. Using real images of the people behind a product can also help ease user anxiety. See how at VWO we make sure that we reveal the people behind our product? The contact information and the physical address of our place of business is also clearly laid out on the map. With the images and physical proof, people warm up to your business, because they are able to relate with it. Without it, it’s just a faceless software product, one of the many out there. It is clearly evident that customer reviews matter. A lot. But how do we use this knowledge? It’s important to note that half of these customers would trust only if there are multiple reviews to read. For the other half, trust depends on the authenticity of the reviews. So it’s not a question of quantity versus quality. You need both. Fake reviews are a nagging nuisance that review sites have to constantly deal with. Check out how Yelp is dealing with it. To maintain authenticity, make sure you promote only genuine reviews and not ones that seem overtly promotional. Amazon does a great job at this. By displaying the reviewers’ identities, and providing a review rating system, Amazon is able to promote the reviews that are found most useful by its customers. How About Bad Customer Reviews? In a study published in 2011, it emerged that reading one to three bad reviews would deter 67% of the shoppers from making a purchase. In a more recent study, 68% consumers said that they are inclined to trust more when there are both bad and good reviews. 30% consumers suspect inauthenticity when they don’t see anything negative. It’s important to feature both negative and positive reviews. For every consumer who seeks out positive reviews, there are three who actively seek out negative reviews. Believe it or not, negative reviews are more popular than positive reviews. All the research points towards having authentic user-generated reviews, good or bad, on your site. It’s a precious commodity, trust. The purpose of the three measures that we detailed in this article is to improve the trust that users have in your business. However, it’s important to understand that trust has a self-correcting nature. At the slightest hint of malpractice or incredulity, trust disappears. Businesses need to earn their users’ trust every day, over and over again. There are umpteen ways to coerce a user into doing business with you, using fake trust signals and reviews and what not. But failing a user’s trust in your business can have catastrophic effects. Bad PR is only the beginning of it. The good part is that unless you are trying to create trust where there can be none, it’s not a difficult thing to do. There’s nothing that drives trust like some good old honesty. Did this article resonate with your take on trust in eCommerce? Are you aware of more ways to generate trust? We and our readers would love to know. A/B testing tricks: How to test additional (new) content in a split test? Consumer trust in the eCommerce industry plays an important role. It’s hard to gain and easy to lose. Shoppers won’t buy your product if they don’t trust you. @Sharan Suresh, You have shared really important factors to increase trust. I would like to add one more point. Word of mouth customer testimonials is the most powerful channel to increase trust. I have the Norton Secure seal for my website. I have it on my home page and in the shopping cart process, where else should I be putting it? Should I be using on my product pages near the add to cart image also? are the any suggestions about that or tests? What about putting the Norton Secure Seal under the Add to Cart image on the product pages? Along with a free shipping text and 60 day money back guarantee text? I just checked out your website. It looks great, and the trust badges are very visible through the entire conversion funnel right from the homepage. There were a couple of things there I thought could help you convert visitors better. For the product page: The Free Shipping and 60 day money back guarantee text under the ‘add to cart’ button don’t really stand out. It would be a good idea to make those text colors different so that they stand out from each other as well. Also, instead of the 60 day money back guarantee text there, you could try using the ‘money back guarantee’ badge that you’ve used on the checkout page. It’s just more prominent, and commands immediate attention. Could be a powerful motivator for people who are on the product page and still jittery about moving ahead. Another test that I’d suggest: on the checkout page where credit card details are sought, try putting those fields in a box that would adequately separate the card fields from the rest of the page. These fields are more critical for a visitor because this is where they actually decide to part with money. Putting those inside a box tells the visitor that you understand this and have taken proper measures to keep their credit card details secure. You already have a bunch of trust badges right there, so it’s already looking great. Good luck! Let us know how these tests fare for you. This is the place where most of the ecommerce lack in. As running an ecommerce website we must pretend to build more trust among users. So that it will help to sustain among the competitors. 9) And we use a lot of personalization methods. Hi Kvasni?ka, that’s an excellent list! Number 8 is new to me. Do you mean the date on which the article was added to the display? If yes, it makes absolute sense. I’ll look out for this one the next time I’m on an eCommerce shop!